When it comes to purchasing steel buckets for your business, look no further than Youngstown Barrel & Drum Co., for your needs. Our steel buckets, or steel pails, are durable, reliable, and able to handle many jobs you have in mind for your business. Our steel buckets can store bulk liquids such as lubricants, thinners, as well as solids such as sand, gravel, and other granular materials. Our buckets are both rough and versatile for any of your shipping needs. Our buckets come with a variety of features that you can choose from that will suit your needs. For steel buckets, you can either choose an open top or closed top steel bucket. Youngstown Barrel & Drum Co., also carry lug lid w/spout and lever lock lid. 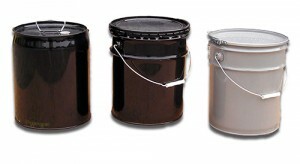 Our steel buckets can also be made to meet FDA compliance. Open top: for any our open top metal pail, it comes with a steel handle with a plastic grip so carrying our bucket is comfortable and easy. The nesting pails allow for more storage in your warehouse when empty. Closed Top: this particular metal pail comes with a screw cap that measures about 2 1/8”. It also has a pullout dispensing spout for perfect pours with little mess. Other closures types are available as well. Lug Lid with Spout: For steel buckets that require a lug lid with a spout, consider a crimping tool to secure it. The crimping tool can crimp four lug lids at the same time, all while applying even pressure on the lids ensuring a leak-proof seal. Lever-Lock Lid: this cover is very quick to use, all while opening and closing easily. This lid is also reusable. We also have the 5 gallon Pail for storing hazardous material. 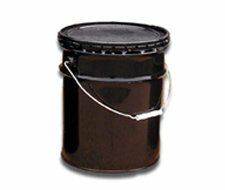 This pail is durable and can safely ship hazardous materials. The empty pails like all our pails can be nested for additional storage while the lids can be stacked on top of each other. The 5 gallon open head steel bucket comes with a Pancake Lid. This steel bucket has a marking of UN 1A2/Y27/S. The bucket is nestable and has a Side Lever Lock Ring. The bucket is available in grey color and weighs 5 lbs. The Interior Dimensions of the steel bucket are 11.25″ I.D. X 12 7/8″ I.H. This open head steel bucket for sale is an idealistic choice for many people in the food, chemical, and petrochemical industries. The pancake lid and the side lever lock ring ensures minimal to no spilling during transportation. Our 5 Gallon Tight head Steel Bucket is available in the standard jet black color. These steel buckets are built and maintain their UN Standard of UN 1A1/Y1.8/100. The model features a 2 1/8″ Screw Cap Seal with a Pull Out 3.75″ Long Metal Funnel. The steel bucket is designed as per the specifications of UN 1A1/Y1.8/100. The weight of the bucket is 5 Lbs. These containers are ideal for the transportation of hazardous chemicals as the interior lining is made for transport and long-term holding of such materials. Apart from being an ideal choice for transporting chemicals, the pail is incredibly easy to use. Simply unscrew and pull out!